"Once in a great while a book will come along that not only touches our hearts but our souls as well; THE PRICE OF EDEN is one of those books. As I read this incredible love story I felt like I was right there with Cait, discovering all the new things she was seeing and the feelings she was having. I would definitely recommend THE PRICE OF EDEN to anyone who likes a touching love story that will stay in your hearts for a long time to come." "This was a wonderful book to read. It was refreshing to see the female character, Cait, grow from a spoiled child, to a woman who truly learned to care for others around her. It was wonderful also to see the male character, Hunter, learn he didn’t have to take everything by force. If you enjoy historical romances set in the 1800’s in Florida, this book will most definitely be the one to read." "This is a passionate story with two very spirited characters. Their fiery arguments prepare us for the passion they release when they finally come together. The author, Bren Yarbrough Bruhn, details a story that shows how the Indians were provoked into going to war. She brings alive the settings through her descriptive tale. I feel that readers who enjoy historical romances will love this story. The Price of Eden is an emotionally stirring story of love set before an Indian war where we meet and learn to care about the characters on both sides." "...Ms. Bruhn has written an enjoyable novel with a lot of historical detail wrapped in a sweet love story. You will sigh over the love between the two main characters as you weep over the circumstances they find themselves in. Hunter is a strong man that most women would love to have claim them, yet Cait’s fiery spirit will not allow him to trample over her. What they go through to find each other makes for an enjoyable and entertaining read. If you like historicals, stories about Native Americans, or gentle romance, you will love this book." "This is a delightful story that is well plotted, visually descriptive with well-drawn characters. There is something for everyone in this story: history, romance, pathos, suspense and humor. The history of Florida and the Seminole Indians is factual, interesting and enlightening. As a history buff I particularly enjoyed revisiting the wars between the US and the Seminoles. The romance was strong and relied heavily on the "it takes three logs to build a fire" philosophy of that genre only occasionally resorting to pseudo tough-love tactics...The author's description is excellent, particularly of the visual. As a native of a nearby and similar region I know if sound (of insects) and smell (of pluf mud) descriptions of equal quality had been added the reader would have been completely transported to the Peace River Valley. The weak portion of the story was the ending. I wasn't ready to forget the remaining characters at that point because they had become too real to me. Though I'm sure that was the Epilogue's purpose it did not compensate for that fact. I find this is often the case in stories with believable, interesting and sympathetic characters. An enjoyable story." Nan Seal is a southerner from the USA, and has worked in academia as a researcher, administrator and teacher. Since retirement she has changed her focus from science to the Arts, opening a studio in her home town. 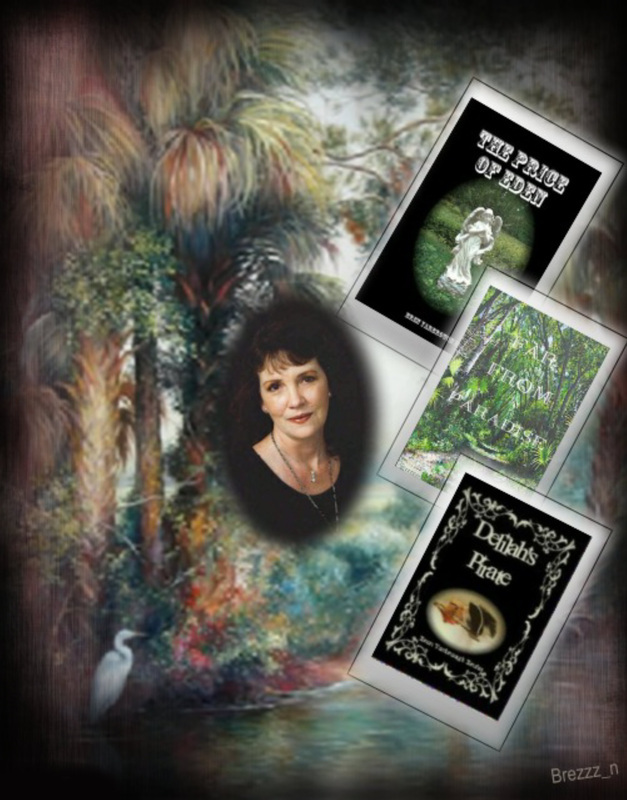 "Dear Ms. Bruhn, I recently had the pleasure of reading your book Far From Paradise for review. I found it quite enjoyable and well written. Good historicals that stick to facts and reality are rather scarce these days so I commend your work on this one. Being accurate does not ruin a novel but simply makes the author rise to the challenge of doing her research and shaping her story around it instead of playing fast and loose with fact! Alegria"
"...Unfortunate events in Florida in the middle of the nineteenth century are well chronicled as the story unfolds. "Although the noble savage and white female captive plot has become nearly a genre cliché, the author handled it well, adding enough twists to rise above the trite. Her grasp of the historical background was sound, and her characters were realistic, while being nobly heroic or vilely villainous, as their roles required. Far From Paradise is darker and deeper than the average historical romance, but is well worth a read if you enjoy a novel of substance. I enjoyed this one and respect the author’s care and craft." "Far From Paradise by Bren Yarbrough Bruhn is a wonderful and detailed historical romance. You were able to see both sides of the war between the white men and the Indians... I loved Jordyn because she isn't afraid to stand up for what she believes in. ... I hope everyone loved the book as much as me." "Far From Paradise by Bren Yarbrough Bruhn tells the story of a family that must decide where their allegiances lie during a time of unrest. This is the second story I have read in this series and I feel that this one is just as good as the first. The relationships that were developed in the first story help the reader to understand the sense of loss when it is learned that those characters have been killed. Hawk's first family was fun and loving. The children full of laughter and mischief that made everyone smile. To learn that they are now dead helps the reader to understand Hawk's feelings. This story however can fully stand-alone and is truly enjoyable. It is filled with excitement and passion. The chemistry is present between Jordyn and Hawk from the very beginning. The story is filled with misunderstandings and jealousy that become obstacles in their romance. The two will have to get past the pain they have experienced in their lives to open themselves to the love in their future. Described in brilliant detail the reader sees from the viewpoint of the people caught in a situation not of their own making. It is heart wrenching to watch the struggle of the Seminole people as they fight to survive. It shows how the people changed and blended in to be accepted. I look forward to reading another book in this series I hope that will feature Looking Horse. A strong warrior that is rumored turned pirate. For a historical romance that will carry you away on an adventure into America's past filled with passion and excitement I highly recommend Far From Paradise by Bren Yarbrough Bruhn." "I always feel good after reading a good pirate book, and Delilah’s Pirate is a luxury read. There were some witty moments after Delilah and James met that enhanced the story. I love how Bren Yarbrough Bruhn cast robust characters, with outstanding dialogue that kept this story moving at a great pace. I adored the part about the zipper and steel teeth; not to mention the underwear and berries. Other cute moments, along the way, make this a superb read. Watching James discovering the present, very different from the past, and Delilah trying to help him, made this story quite entertaining. Great writing, intense moments, and a mixture of characters spinning a great yarn, do indeed produce a grand tale."